Thw always smiling staff, a really good breakfast, nice vibe and the perfect location made our stay in Salvador with Galeria 13 an amazing experience! Tnx guys! Een heel gezellig hostel, bestaande uit twee delen die op 1 minuut lopen van elkaar liggen. Het is schoon, gezellig en de staff is zeer vriendelijk en behulpzaam. Free caiparinha hour zorgt voor veel sfeer en gezelligheid! Alles aan dit hostel is gewoon goed. Het enige mindere punt (maar dat is persoonlijk) vind ik de buurt. Het centrum van Salvador is druk en niet bepaalt veilig. Gelukkig zit het politiebureau om de hoek, wat de omgeving wat veiliger doet voelen. 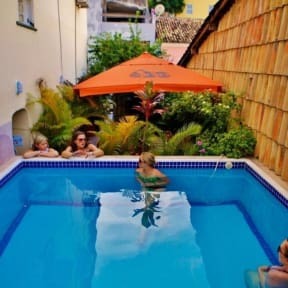 One of the best hostels ever! The owner is a very enthusiastic guy who creates an awesome atmosphere. The breakfast is until 12 and you even get fried eggs! There is a very strong wifi and all the other facilities are there! Every day there are free caipirinha's to take! A must go! A nice hostel, I very much liked my stay here. They do great breakfast, it was an absolute joy waking up. 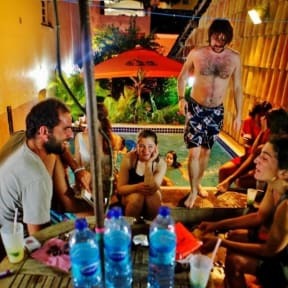 The location is perfect, there are free Caipi's, the staff is friendly, it is clean.. what more do you wish for? Such a great hostel! Atmosphere is great with a lot of guests from all around the world. Jonathan is a really nice host, makes you feel welcome and at home. There's a swimming pool and a lot of things to do. Happy hour is amazing, even though we sadly didn't make it every time XD Would definitely recommend en we will be back when in Salvador. Loved this hostel; the most amazing vibe and super friendly staff. Clean, good breakfast and ideal to meet other people during happy hour. Mattresses could be better but who cares. Definitely recommended!